At home in Seattle, Doug Einck and his wife Jeanie were classic Pacific Northwest outdoorspeople who loved skiing, kayaking, hiking and cycling. While vacationing in Hawaii in 2014, a surfing accident left Doug with a stiff neck and a headache –the only symptoms of a stroke in his right motor cortex that went undetected for five days. 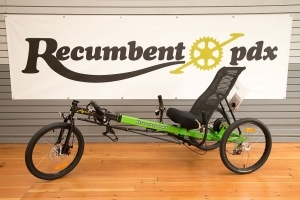 Cycling had been integral to their lives and would be to recovery, so Doug and Jeanie road-tripped to RecumbentPDX for a Catrike Road outfitted with rear suspension. Shifting and braking were moved to the ride side and a Terratrike Velcro Grip Glove secured his left hand to the handlebar. The addition of lights, fenders and a pannier rack make this the perfect trike for all-weather riding of the Seattle hills.